Eaglet Number 2 Is On The Way For America's 'Most Patriotic Nest Cam' : The Two-Way The American Eagle Foundation confirms that there's a "pip in progress" on the second egg in the nest in the National Arboretum — meaning the baby bird is starting to break its way out. A still image from the American Eagle Foundation shows the eaglet from egg #1, and egg #2 — with the pip, or developing hole in the shell — just beginning to be visible on Saturday. The best-loved baby bird in the nation's capital is about to have some competition. As we've previously reported, "Mr. President" and "First Lady," a mated pair of bald eagles in the National Arboretum in D.C., have been incubating two eggs before a rapt audience, thanks to a 24-hour web cam. "After days of anticipation, a fuzzy wing flopped out of the remains of an eggshell Friday morning ... The bird then worked its way out of its shell over the next hour, emerging more fully around 8:20 a.m. ET. 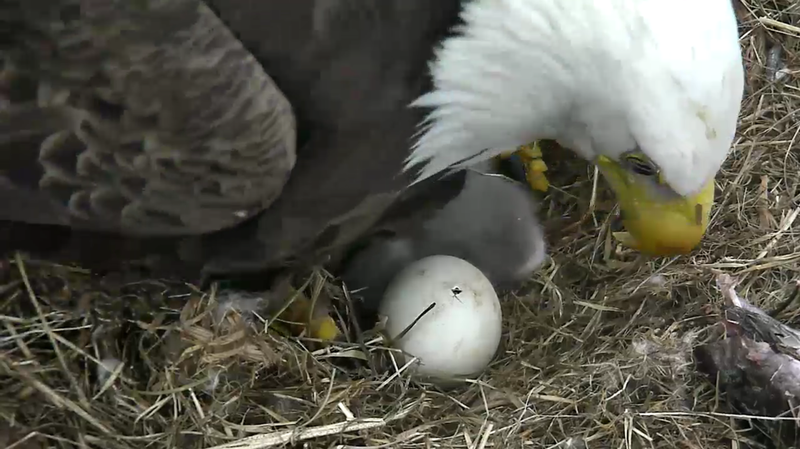 Well, that second egg has moved from unhatched to hatching: the "pip" has been detected. That's the first hole the baby bird pecks through its eggshell, as it works its way out into the world. As the hours passed on Saturday, the pip became more visible. The "pip in progress" was confirmed by the American Eagle Foundation around 10 a.m. EDT on Saturday. By early afternoon, there was a visible hole in the shell. 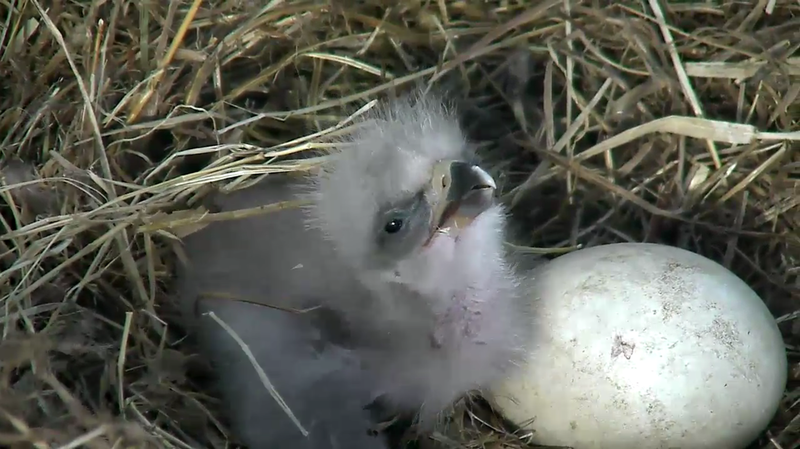 It could be a while yet before the second eaglet fully emerges; in the case of the first baby bird, more than 24 hours passed between pip and final appearance. The newly hatched bird will be joining an older sibling who has already mastered sitting up, looking around and eating, so there will be some catching up to do. If you want to keep tabs on either bird you can watch the webcam — which has been dubbed "the most patriotic nest cam in the United States" by the American Eagle Foundation. If you tune in from 2-4 p.m. EDT on Saturday, you can also join in a livechat with other webcam-watchers and experts. We'll reiterate the warning from the foundation that "this is a wild eagle nest and anything can happen." So yes, there's a non-zero chance you might witness something unpleasant happening to a tiny, adorable ball of feathers. And if you watch long enough, there is a 100 percent chance that you will see violence done to a fish. 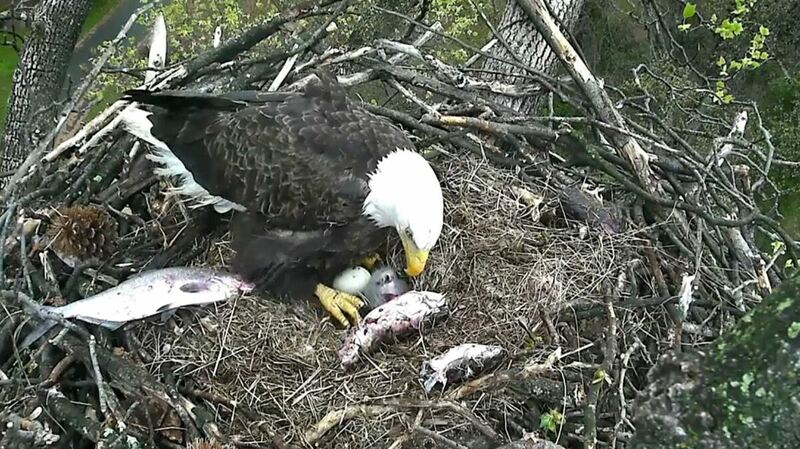 Surrounded by the remnants of a meal, one of the adult bald eagles watches over the eaglet and the hatching egg. Both the male and female — that is, both Mr. President and The First Lady — take turns in the nest.